Due to the technology-specific system software, the field of application of the SINUMERIK 828 controls ranges from vertical and basic horizontal machining centers – including, of course, mold making applications – to flat and rotary grinding machines through to dual-channel turning centers with counterspindle, driven tools and Y axis. SINUMERIK 808D ADVANCED is perfectly preconfigured to meet the requirements of basic standard machines. SINUMERIK 808D ADVANCED together with SINAMICS V70 drive and SIMOTICS S-1FL6 motor guarantees a high system performance. The high-speed bus communication between CNC and drive ensures a close loop for the position control, which leads to a high accuracy and optimum cutting performance. The international first class CNC technology opens up unparalleled potential for basic turning and milling machines. With the support of up to 5 axis/spindle, the SINUMERIK 808D ADVANCED T system is sufficient for basic turning machines as well as for turning centers without Y-axis. Thanks to the Advanced Surface function and the high dynamic SINAMICS V70 drive system, the SINUMERIK 808D ADVANCED M system also covers the machining of mold & die parts. SINUMERIK 808D ADVANCED M offers a high price-performance ratio for basic milling machines. 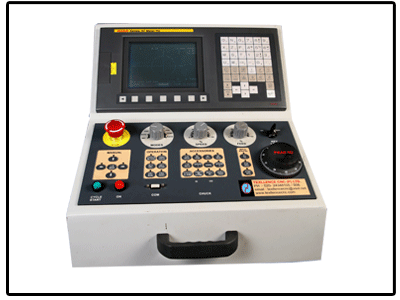 Multi-axis control and two-part systems for compatibility with various machines Multi Axis Max. Capacity Machining program capacity is greatly enhanced to the standard of 500kB [1,280m]. Multi-program Up to 20 PLC program files can be registered, which are executed according to priority. A PLC program can be split into each process and developed. High-speed PLC engine installed (TypeA) TypeA is equipped with a high-speed PLC engine, helps enhance the performance.